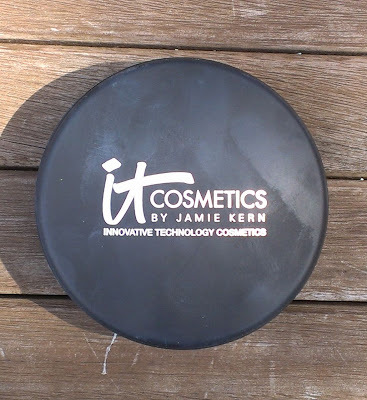 A couple of years back, I purchased the It Cosmetics Bye Bye Under Eye Concealer and Bye Bye Pores Powder. I like both products quite a bit and find that they're nice additions to my makeup collection, but I can't say that I was wowed by them. I mean, I have under eye concealers that I like a little better than the Bye Bye Under Eye and the Bye Bye Pores really does make my pores disappear but I find that I can only use it in warmer weather since it can look a little powdery on dry skin. However, recently, I've been on an It Cosmetics kick. I've purchased quite some new things and I have to say, most of them have wowed me. The Celebration Foundation definitely falls in that category. 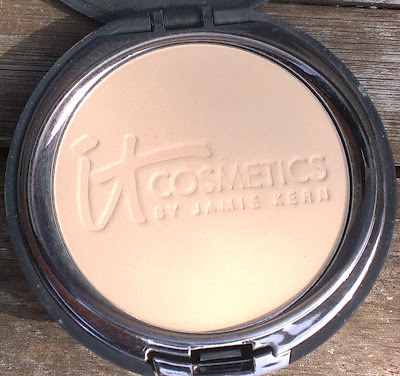 I've mentioned before that it can be difficult to find a powder foundation that cooperates with my drier skin. 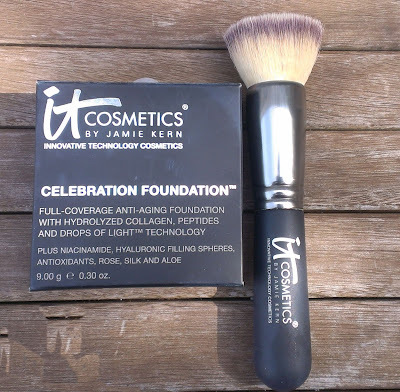 Because the Celebration Foundation is meant to be an anti-aging foundation, it contains ingredients like niacinamide and hyaluronic filling spheres that makes it a really good fit whether you have mature or just dry skin. It comes in a black compact with a rubberized finish that is hard to keep clean (You can probably see my dirty fingerprints on it in the photo below) and provides 9 grams of product. There's a small mirror inside the lid that's adequate for touch-ups throughout the day. It Cosmetics touts this foundation as being full-coverage -- I'm not sure that I'd go that far because it doesn't quite cover everything so if you have serious redness, darkness or scarring, you'll likely need to conceal before hand. However, it does cover quite a bit and you can layer it to achieve fuller coverage -- just make sure to apply light layers so you don't wind up looking too cakey. It definitely offers more coverage than the Tarte Amazonian Clay Full Coverage Airbrush Foundation, so it may be a good alternative if you were disappointed in how the Tarte foundation covered. 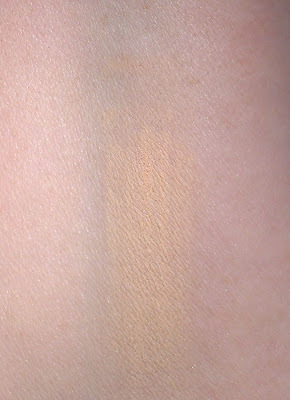 The finish of the It Cosmetics Celebration Foundation isn't quite as glow-y as the Tarte Airbrush Foundation, but it's not exactly matte either. I'd call it semi-matte -- it looks nice and natural on the skin and shouldn't create too much shine if you have an oily t-zone. 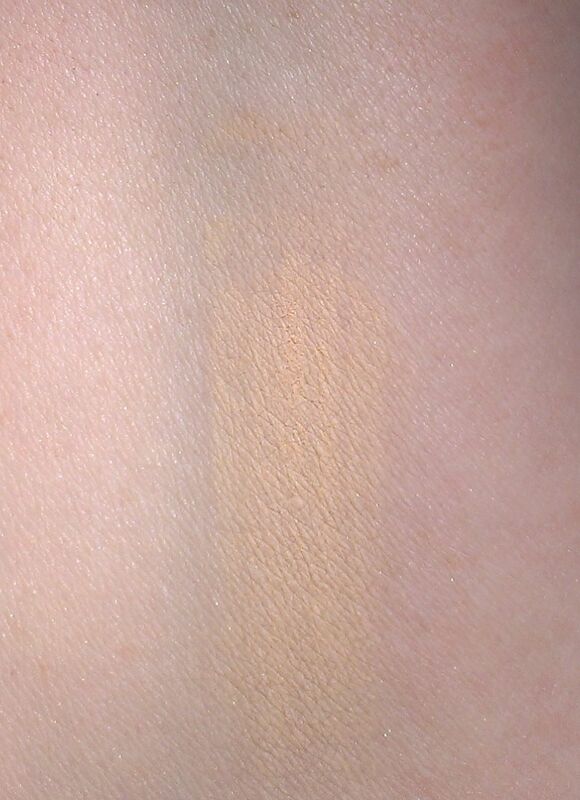 I purchased the foundation in the lightest shade, Fair, and it's a pretty good match for my pale skin. You can purchase the foundation from QVC, the It Cosmetics website, and beauty.com. I bought it from QVC where it came with the Heavenly Luxe Buffing Airbrush Foundation Brush, which is essentially a flat top kabuki brush. All of the It Cosmetics' brushes I've tried are ridiculously soft and this one is no exception. It's ideal if you want to apply the foundation for fuller coverage, though you're probably better off with a fluffier brush if you want a lighter application. For the foundation and brush, I paid $39.56 plus s/h, which is a pretty great deal if you ask me. If you're in the market for a powder foundation that provides medium to full coverage, a semi-matte finish and is compatible with dry to slightly oily skin, I would definitely recommend giving the Celebration Foundation a try. Have you tried the It Cosmetics Celebration Foundation? What's your favorite pressed powder foundation? I'll bookmark your blog and test again right here regularly. I'm quite sure I will learn plenty of new stuff proper right here! Neutrogena Healthy Skin Anti-Wrinkle Cream is also available in an intensive night cream formula. As with any hot commodity where the demand is great, you get a few unethical people who claim to have the qualifications that enable them to carry out cosmetic surgery, and to do so at a vastly reduced price.